Also referred to as the land of a thousand hills, the destination Rwanda is one of the 3 countries on the globe that have mountain gorillas which have in turn provided the ground for gorilla trekking safaris in Rwanda. In her north western protected area of Volcanoes National Park, Rwanda supports a substantive section of mountain gorillas out of the 480 that are recorded to be living in the massif of Virunga. The Rwanda gorilla trekking safari experience arises from the existence and conservation of these precious Species. The travelers are able to add up other Rwanda safari activities like Chimpanzee trekking in the forest of Nyungwe, the wildlife safaris in the savannah landscapes of Akagera and the historical tours to the genocide sites along with Butare cultural tour on top of the prime activity which is gorilla trekking. The gorilla safari in Rwanda commences at the point one initiates the idea of traveling and this is followed by research from the available sources about where, when and how it can be done and after this is ascertained, the traveler will contact the respective person or an organization that will enable him / her realize the dream. The booking process starts and at times many operators are contacted and the eventually considering the package, reputation, promptness, reliability and possibly the price determines who to travel with. 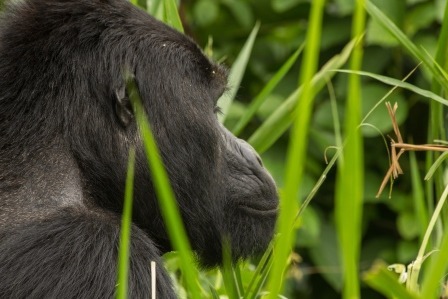 The dates are fixed and the gorilla permit secured from the Office of Tourism in the Rwanda Development Board with $750 as the price for the permit and dates reach, the traveler boards to Rwanda using any available flight and upon arrival he / she meets the representative from the booking company and the Rwanda gorilla safari implementation starts. Depending on the itinerary, a night can be spent in Kigali or they can transfer to the famous Volcanoes National Park to the country’s North West passing through the scintillating hills with lush green that earned the country the crown of the land of a thousand hills. This is followed by a delicious dinner served freshly in the foothills of the Volcanoes. The trekking commences in the morning and things that one read in books, on line sources or stories from friends and family become apparent and he / starts experiencing the reality. An early arrival at Kinigi guarantees you an avenue to explore the local people who have transformed from gorilla enemies to gorilla friends. They have lived with them millions of years past! They treat you to remarkable Kinyarwanda performance at a zero cost and feel free to pick a cup of hot coffee courtesy of Rwanda Development Board to neutralize the coldness of the mountains while being mesmerized by the local show. Gorilla families are allocated and the briefing is conducted to enable you recap the do’s and don’ts that you read previously. At this point, you are imagining about the moment with the gorillas. Fine, but keep it for a while for there is a price to pay. Depending on the family allocated, you connect to the trail head usually driving there in the company of the park ranger. You head to the mist covered forest perched on the slopes of the Volcanoes in search of the mighty apes. In the process be careful not to lose attention to your initial mission and be captivated by the birds, the lush flora, the amazing sceneries of the eight mountains of the Virunga range and the other fauna like the duikers and the buffaloes. The challenging slopes, slippery surfaces of the loose volcanic soils, the jungle sounds and maneuvering over dense forest are part of the price that you pay to realize your ancient dream. The moment comes and you are with gorillas. At times, you may not believe it and think that it’s an illusion but everyone in the group is fascinated and still questioning? The Silver-back comes your way and you’re like the wow! Gorillas in the Mist, you are with the gentle giants, the long lost cousins and yes the similarity is clearly observed. It’s an adventure indeed. The guide is not mean in anyway, you have a themed interpretation about the gorillas in detail and do not withhold any question. The apes are photogenic but keep the flash off and since they do not know about the rules, do not hesitate to step back in case it encroaches on your 7m gap. The experience is thrilling; the gorilla trekking in Rwanda is real and after you get home to share memories.